Surf faster with UC Browser ! India is the land of cricket buffs.You know that IPL is on when you see the midnight oil burning in a home for months .You know that an Indo-Pak match is on when the streets are deserted even on a Sunday.You get it -We love Cricket ! I have also been an avid cricket fan , though the nitty gritties of silly point has still been away from me yet I do enjoy watching a game of cricket .It gives you that thrill .All most every adult in India has played gully cricket at some point in his life , this is how crazy we are for the game ,it runs in our blood. But it becomes difficult to keep scores when you are out , on a metro or in the office .Earlier I remeber peple would be glued to their transistor radio sets when travelling and a whole crowd of cricket enthusiasts would gather around to hear the latest development in the ongoing match .People would cluster around T.V. sets and watch the proceedings . But with today's fast life , one can't afford to stay glued to one place to watch your favourite player hit a six or play his trademark helicopter shot ! You need some flexibility , some portability where life does not come to a stanstill and yet you can enjoy your game of cricket .This can be possible if you have an internet browser that gives you live cricket like the UC browser .I recently installed it on my Android and was amazed to see how fast it was , no wonder our very own Yuvi endorses it ! 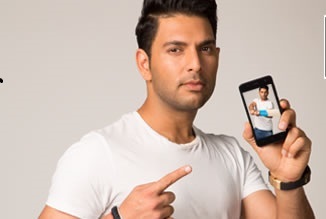 There is no more the need to google to get the live score , just download the UC Browser Yuvi version and get the best cricket service in India including Live Scores and the latest news. I have added a screenshot to explain how easy it was even for someone like me who needs her teenager's help for simple downloads .You can download it on your PC or android and even iphones . 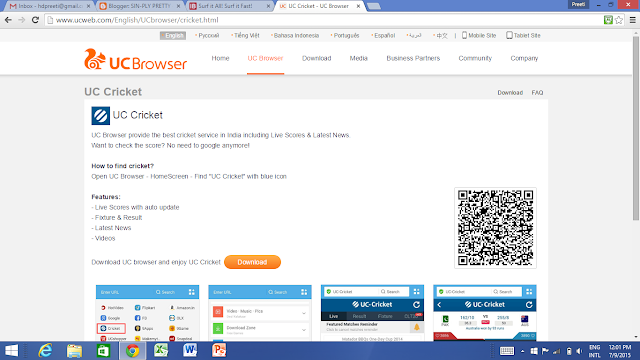 It is as easy as ,Open UC Browser - Home Screen - Find "UC Cricket" with blue icon and Voila you are welcome to treat yourself to the big cricket world uninterrupted and available on your android !Now no need to stay at home feigning illness to watch your favourite team battling it out on the cricket ground .All you have to do is just download the fastest cricket viewing Browser in India and your life is set . As a woman , this gives me the flexibility to work at my blog and keep myself updated with the latest on goings in the cricket field . I can even check out more than two million latest Bollywood trailers, music and celebrity videos all in one place with a single click of my mouse .Another plus points is that all the lightning fast downloads are FREE .Even the movies available for download are absolutely free . Also one can enjoy high speed internet downloads with a resume option when interrupted .So no more missing any shots .It offers more user friendly themes and an improved Data compression technology which helps save more data . I am definitely loving this new cricket browsing experience , download it yourself and feel the change .